You can fly directly to Morgantown Municipal airport (MGW), fly to Pittsburgh, PA (PIT) and rent a car, or use the WVU Mountain Line bus service. Please request the WVU special rate when booking your room(s); prices are listed for each hotel. Special Deal: You can book either Fairfield Inn and Suites or Courtyard Marriott using this special link, and can only book it online through this link. Rates expire by 10/27. WVU Rate $99 per night; use special link only for this rate. Offers free shuttle to locations in Morgantown, including for the Hackathon. WVU Rate $104; use special link only for this rate. Offers free shuttle within 5 mile radius from hotel. There are two main options for parking near the Media Innovation Center for the Hackathon: 1) free parking at the Coliseum (which requires a 10- to 15-minute walk) or 2) hourly paid parking in surface lots near the center. Participants should also check with their hotels to see if they offer shuttle service to WVU. They should ask for the Evansdale Crossing building at 62 Morrill Way on the Evansdale campus. The Coliseum is located at the corner of Monongahela Boulevard and Patteson Drive. After parking there, participants will need to walk across Monongahela Boulevard at the crosswalk with Evansdale Drive. 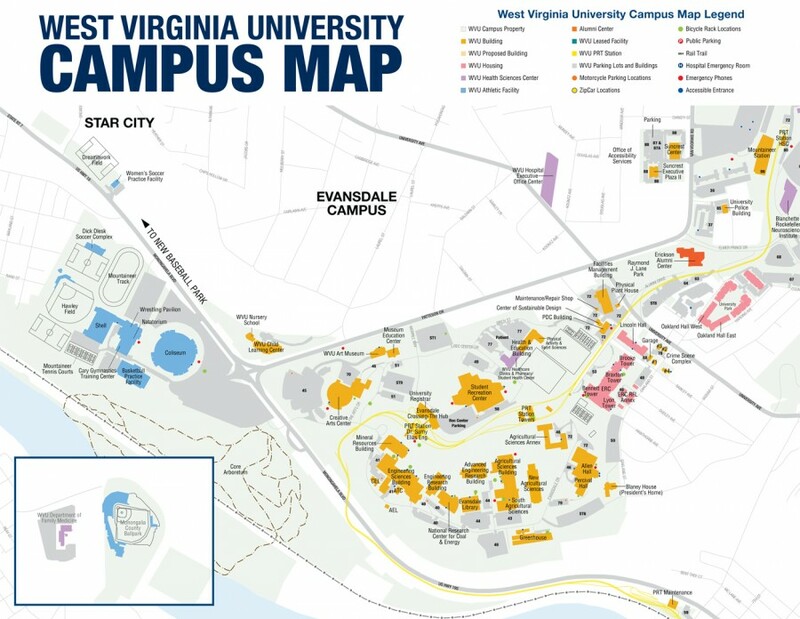 Follow Evansdale Drive toward the Mineral Resources Building, and then veer to the left toward the PRT transit station. Follow the covered walkways to the left past the entrance to the PRT, which will take you through an elevated breezeway into Evansdale Crossing. You will enter on the fifth floor and can take either the elevators or stairs down to the fourth floor, which is where the Media Innovation Center is located. See the map below for more details. The three hourly paid lots nearest the building are ST-1, ST-4 and ST-9. Visit the interactive parking map for more information about the location of each lot. Parking is currently $0.50/hour in ST-1 and $1.25/hour in ST-4 and ST-9. Payment is only required Monday-Friday 8 a.m. – 4 p.m. Participants will then need to walk up Morrill Way toward Evansdale Crossing and enter on the first floor. Take the elevators or stairs up to the fourth floor, which is where the Media Innovation Center is located.